This limited edition bracelet is made of eight great BIG (12mm diameter) vintage Swarovski crystal discs, each one channel set in brass. I've alternated the colour sequence between Montana sapphire -- a dusky navy blue -- and a rich olive green. 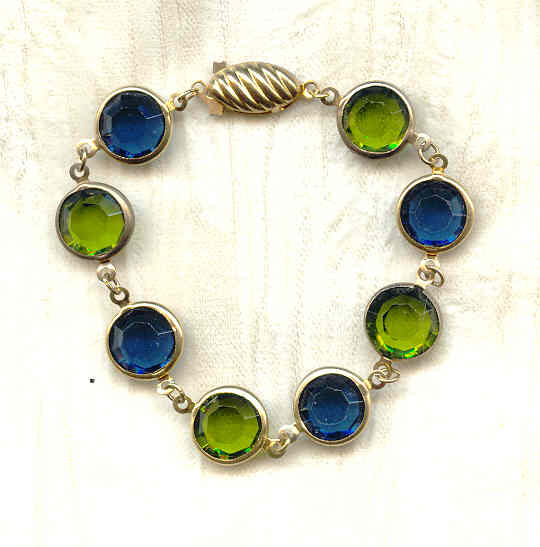 The faceted olive green glass focal is a 25 x 18mm oval made for the late jewelry designer, Miriam Haskell.